Our beloved fur baby was hit and killed in front of me on January 22, 2015. 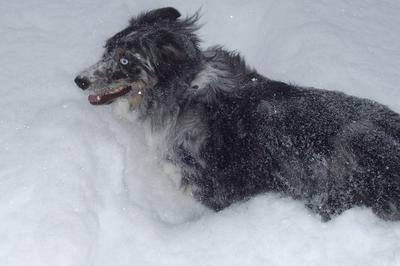 We got Monty July 2007 out in Montana. She would have been 8 this year. She traveled all the way back to Vermont in the backseat of our truck. She was Miss Independence and had a mind of her own. She loved to help get the cows back in the pasture when they got loose. She had the most beautiful blue eyes that would change with what ever mood she was in. She was such a quick learner and very stubborn too. She saw my husband and myself through a lot of hard times. The biggest was when we lost our son in 2011 as a preemie. She then welcomed our daughter into the family in 2012. She would let our daughter do anything with her but when she had enough it was voiced. It is so hard to believe that she is gone from our family. 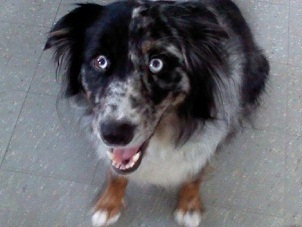 Our male Aussie Ajax misses her too. There is a huge hole in our hearts. I know she is with our son Cody as his loving companion as she was to us here. Monty, you are greatly loved and missed. I am so sorry for your loss. Our dogs and cats are part of our families. Those of us who have pets know the pain you are feeling. They will always hold a place in your heart. Monty was a beautiful and smart girl! It amazes me how these pups seem to be able to rescue us in some or our worst times. After my divorce my girl Bianca gave me something to smile about every day when i had nothing else left to smile about. She survived a hit by a truck (one of the scariest moments in my life) and stayed with me until shortly after my 2nd marriage. We just lost our 8 1/2 Aussie Max 2 weeks ago. He was hit by a car also. The sadness is over bearing. 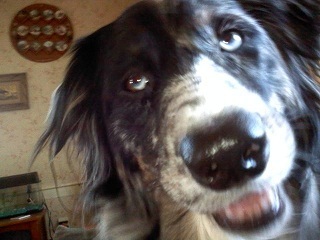 He was my grandpup but had always lived with us. I too lost a child 28 years with heart disease. The grieving is of course different but they are family and Aussies are the best. My heart goes out to you!! Join in and write your own page! It's easy to do. How? Simply click here to return to Rainbow Bridge Aussie Memorials.